Otis Technology 640-852 Law Enforcement Tool Kit FREE SHIPPING! Jammed guns and misfires can be frustrating at the range, but out in the field they are lethal. Keep service pistols and firearms in prime working condition using the Law Enforcement Tool Kit from Otis Technology. 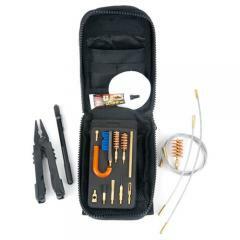 Designed to be the ideal firearm field kit, the comprehensive set contains all essential tools needed to take apart and clean virtually any firearm. The Memory-Flex® cleaning rods flex to clean hard to reach parts of weapons that are often overlooked. Brass slotted tips, cleaning patches and bore brushes combined with Otis' special all-in-one cleaner break down carbon, copper, excess gunk, grime and residue so barrels are clean and its firing mechanisms run smoothly. The Breech-to-Muzzle® system properly cleans automatics without disassembly, while a handy straight pick cleans locking lugs. All components are stored neatly in a soft carry pouch with MOLLE attachment points for easy transport and secure storage. ©2002-2019 CopsPlus.com: Otis Technology 640-852 Law Enforcement Tool Kit FREE SHIPPING!